Oil trains transporting crude oil from the Bakken region of North Dakota and Canada to refineries in the Northeast have suffered several derailments in the past few years. The U.S.Department of Transportation(DOT) has since urged rail companies to adopt new train cars which could better survive derailments, and to retrofit current cars by 2017. Still, railway safety advocates say companies need to do more to ensure the safety of their tracks and cars. Two separate oil train accidents this week support their concerns. In 2013 U.S. railroads carried more than 400,000 car loads of crude oil, a sharp increase from the 9,500 they carried in 2008. Crude oil from North Dakota’s Bakken Shale region has fueled most of the surge, and this surge has increased the potential for rail accidents. Each train carrying more than a million gallons of Bakken crude could cause damage similar to what occurred in July 2013, when a runaway train derailed in Lac-Megantic, Quebec, killing forty-seven people. Another derailment near Lynchburg, Virginia in April 2014, spilled about 30,000 gallons of Bakken crude oil into the James River. In 2005, a semi-truck hauling 35,000 pounds of explosives through the Spanish Fork Canyon in Utah crashed and caught fire, causing a dramatic explosion that left a 30- by-70-foot crater in the highway. The cause of the massive blast on the Utah highway, brought on by a process called deflagration-to-detonation transition (DDT), posed something of a mystery. The semi-truck was transporting 8,400 cylinders of explosives intended for blasting operations in the mining industry. Despite the cargo’s volatile nature, it was not supposed to detonate violently as it did. Such accidents are extremely rare but can obviously have devastating results. So understanding better exactly how such explosions occur can be an important step to learning how better to prevent them. In 2008 American railroads carried 9,500 cars of crude oil. By year end 2013, that number reached 415,000 cars loads. America’s energy boom, made possible by hydraulic fracturing, or fracking, and the surge in oil output in North Dakota’s Bakken region, have made crude by rail tremendously profitable for the nation’s top railroad companies. The surge in crude by rail has come at a high cost: a growing number of deadly accidents, derailments, and oil-spills. Experts say that these accidents demonstrate the limited ability of government and railroads to manage the hidden risks of a sudden shift in energy production. “It may not happen today or tomorrow, but one day a town or a city is going to get wiped out,” says one expert. Transportation of crude oil by train jumped to 408,000 in 2013, from 11,000 in 2009, partly due to the rise in production from North Dakota’s Bakken region, where oil production has surpassed pipeline capacity. The increasing use of rail to transport crude oil has resulted in several accidents. The Department of Transportation want to phase out older tank cars — because they have thinner shells and are thus more vulnerable to accidents when transporting flammable liquids like crude oil – and replace them with new, safer tank cars with thicker shells. The petroleum industry and U.S. railroads want DOT to extend the deadline for phasing out old tankers from two years to four years. In May 2014, the U.S. Department of Transportation(DOT) ordered railroads operating trains carrying more than one million gallons of Bakken crude oil to notify state emergency officials in states through which oil-carrying trains travel of the expected movement of such trains. The order came to allow first responders to be better prepared should an accident occur. CSX Corporation agreed to share shipping information with West Virginia officials, but refused to release the information to the public citing concerns about terrorism. DOT made it clear that citing terrorism concerns does not exempt crude oil shipment information from being released to the public. Iowa officials have announced that they will alert the public about trains carrying one million gallons or more of “extra-flammable” crude oil throughout the state — despite the argument of railroad companies that the information could pose a security threat. Iowa’s decision places the state in the spotlight as a possible model for how the rulings will proceed in the rest of the country. In May, following extensive debate regarding security concerns, U.S. Transportation Secretary Anthony Foxx ordered railroads to share oil train shipment information with states, in order better to inform first responders should an accident occur. In the first quarter of 2014 alone, there were 110,000 carloads of oil. Each train can carry three million gallons of oil. The boom in U.S. oil shipments by rail is largely due to the growing production of shale oil from the Bakken fields in North Dakota and Montana, but also due to the slow construction of new oil pipelines. U.S. freight railroads are estimated to have carried 434,000 carloads of crude oil in 2013, compared to 9,500 carloads in 2008. In 2014, 650,000 carloads of crude oil are expected to be carried. 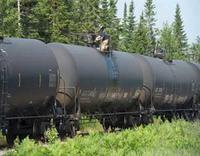 So far U.S. crude oil shipments by rail have reached a record 110,000 carloads in the first quarter of 2014. Transportation Secretary Anthony Foxx issued an order in May for railroads to provide states with details on routing and oil-train volumes. Last week, U.S. Department of Transportationofficials affirmed that details about volatile oil train shipments are not sensitive security information, thereby allowing states to release such information to the public. With the increase in available oil from fracking and larger pipeline capacity, railways are moving more and more oil. Rail companies moved 400,000 oil carloads in 2013, dwarfing 2005’s 6,000 oil carloads. The increase in oil shipments of oil has led to an increase in the number of accidents involving oil tankers. In the wake of recent accidents, the U.S. Department of Transportation (DOT) has released an emergency order to railroad companies which is designed to reduce the risk when shipping crude oil across the nation. One of the charges against Montreal Maine & Atlantic Railway (MMAR), the rail carrier operating the train which exploded in the small city of Lac- Mégantic, Quebec in July 2013, was that it mislabeled the cargo, claiming it to be less hazardous than it was. The mislabeling and downgrading of the contents of the cars allowed to company to take less rigorous security measures to secure the cars without appearing to break the law. The U.S. Department of Transportation (DOT) is moving against other carriers who mislabel the contents of their cargo to avoid the cost of required security measures.